Yes...I really am that weird. 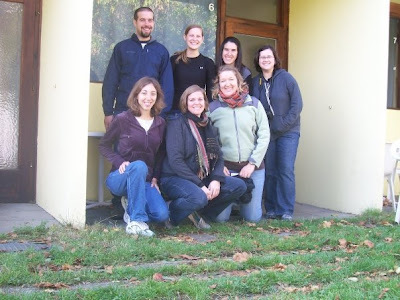 For Fall Break this past weekend, Liz organized a camping trip just outside of Vienna. While it wasn't roughing it by any stretch of the imagination, it was a lot of fun. It was great to be away from our hectic everyday lives and enjoy good company and fresh air. Once we made it to the top of our last hill after hiking through uncharted territories we opted for a short nap on the grass...it was pretty great. We also found a friend to bring back with us, Maynard. Earlier in the month we had a fire drill. Aside from the first drill these are always a surprise...as you will soon see. This particular morning I had finished reviewing our class agenda for the day and had begun a simple prayer. Oops...I'm such a great example. Last week I started teaching my first piano students. It was pretty fun...especially since this family holds a special place in my heart. Alonso is in my class now and Eli (in the middle) was a favorite from last year. Yesterday I went with friends to an apple farm. First we learned about and harvested potatoes. Then we took a tractor ride to the apple orchard. We picked a bag of apples to take home. Once back we watched apples being pressed into juice. We ate our potatoes, drank our juice, cooked some sausages and even had s'mores. Finally after a visit to the pumpkin patch we headed home. Thankfully in time for the wet weather and especially since I squished it into my suitcase from the States. My student reports that the rocket is leaving Earth and will pass the moon, "Upiter," and Saturn. When asked where he learned this he replied from TV. Not bad for a five year old. Last weekend I went to cheer on our cross country team...which consists of two students and two "coaches." Actually Mr. Klein is the coach and I just keep them company. FOr this race we joined a city race. Our only runner of the day did a great job, coming in first in her age group. Last Saturday was Long Night of the Museums. This year was a little more laid back than last year, in fact we only got around to five museums. That's what happens when you get older. The first place we visited was the National Library. We Americans affectionately call in the Beauty and the Beast Library. The next stop was the Papyrus Museum. Where we saw various manuscripts written on papyrus. We even had the opportunity to write our own messages on papyrus. Here is Sara and Whitney posing as they write. And Rachel and myself diligently discussing and working on our own hieroglyphics. We also visited the Film Museum and the Bible Center and ended up at the Globe Museum. Another favorite from last year. If you look carefully you can see Sara contemplating the evolution of globes. A long, tiring, but fun night with friends.